Get the peace of mind you've been looking for. Stop worrying about The Compounder data that's stored on your pharmacy's computers. Quit wondering if you're backing up the right information at the right time. Nobody knows how to get your information from The Compounder database completely and safely backed up and then restored in case of any kind of hardware emergency or failure better than us. The backups are scheduled to run after the pharmacy closes for the day, but can be run at anytime. Every morning you will get an email with the backup status. You can also log in and view the backup files at any time. By using our offsite backup service, your data is safe on our secured servers. What happens when the automatic backup occurs? When we back up your data, your database is checked for any errors, backed up, compressed, encrypted and stored on our data center secure FTP servers. NOTE: A data center is an offsite building that houses your data with IT and communications facilities in a safe, secure environment. Offsite backups help your pharmacy stay HIPAA security compliant. Many users ask us how this differs from other off-site backup services or web based services that synchronize files between computers. Our service first creates the backup file. Second, the service does a test restore to make sure the backup is restorable. Third, the backup file is compressed and encrypted. Fourth, the encrypted backup file is then transferred to one of our secure servers. The checksum is checked and if (and only if) the file is 100% checked, e-mails are sent to both PK Software support and the user letting them know that the backup is complete. We also maintain copies of the last FIVE backups completed. Other services simply copy the file. If the file is damaged it is still copied. There are little or no safety checks. Also what about HIPAA requirements? Is the data encrypted? Additionally our backup servers check to see when your last backup was done and send you the e-mail! No e-mail configuration or settings on your side. You can also send the e-mail to multiple e-mail addresses! We received a call from a user that said when they booted up their Windows 2008 server, they received a message that said "Hard disk failure". They contacted their IT personnel, who said the soonest they could get there was in about 8 hours to look at the computer. The user then called us. We used our web based software to access a client computer on their network. We restored their most recent backup from our secure ftp server to one of their clients. We reconfigured the computer to work as a server. From start to finish, the total time was less than 45 minutes and the user could continue to process prescriptions and work with their pharmacy data. "You guys are lifesavers!" After their server was fixed, we moved the data back to their server. Don't let the low price fool you! 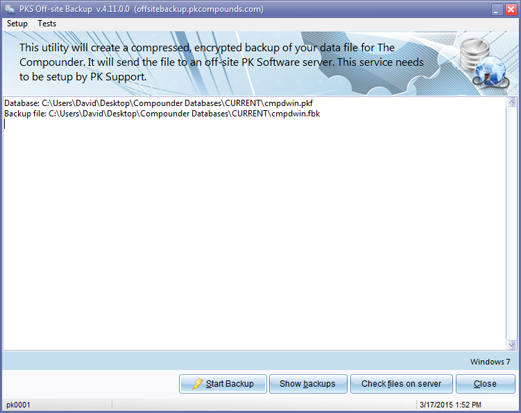 This is a great backup service that simply does what it says and does it well! What Do I need to do when I replace our servers? What Do I Do When I Don't Get the Automated Emails about My Backup Status? How to I check the status of my backups in the PKS Offsite Backup utility? What happens when I need to restore from my backup? Answer: What Do I need to do when I replace our servers? When you replace your server, make sure you contact us right away. We will need to reconfigure the offsite backup utility. You will start getting email messages telling you that your backup is X days old. It only takes about 10 minutes for us to log in and reconfigure the utility. You will need to know the Administrator name and password. Answer: What Do I Do When I Don't Get the Automated Emails about My Backup Status? When the offsite backup was set up, your email address was entered into the setup. Our backup servers send out the status of your last backup every day at 7:00am CST. If you do not get your email, make sure that the emails are not getting filtered by your spam filter. The email is from pkoffsitebackup@pccarx.com. You can also check with your ISP to make sure that the emails are coming through. If you want to update your email address. Go to Backup->Select offsite backup. When the application is displayed, press the Settings button on the menu. Enter your email address and press the UPDATE button. This will update your email address on our servers. Answer: How to I check the status of my backups in the PKS Offsite Backup utility? You can use the Offsite Backup utility to view the directory of the files on the server for your account. The information is technical in nature, so it would best be understood by someone with IT knowledge. Start the PKS Offsite Backup Utility. From the main window press the "Check Files on Server" button. It will take a little time and then will display the files in the folder for the backup. Answer: What happens when I need to restore from my backup? When you need to restore from your backup you are generally at a critical time. This is where our knowledgeable staff gets involved right away. We will first determine why you need to restore the data and determine what is the quickest time to get you back up and running. First call our technical support and let them know that you need to restore your data. A support representative will log into your computer and discuss with you what happened. We will then upload your data file to your computer. This process generally takes less than an hour.